I am special. My work is special. My life is special. My awards are not special. People think awards are special. Awards represent an opportunitist's method of appreciating your specialness. Usually you pay for your award in the form of submission fees and/or awards fees. Awards can be illusory and are a temporary reflection on a job well done. The nameplate keeps falling off of my award. I have stuck it back on numerous times and if I think back enough, I believe I even glued it at one point. My beloved award is so special to me because it reminds me of how perspectives change. I can think of a dozen different projects we have done that deserve far more credit. We have produced educational material that has informed people of new technology, treatments for diseases and marketed new devices for surgical procedures. My father always had a "thinking man" pin that he won for some of his ideas in engineering back at Air Research. My grandfather was awarded for ideas in engineering and my great uncle even worked for NASA during the lunar landing. With a family of idea makers and engineers, I sometimes feel obligated to earn a certain amount of notoriety. The reality is however, is that today awards aren't often given for breaking new ground. They are mostly an acknowledgement of all that is "standard" and accepted by the masses as accomplished. That's not to say that they don't sometimes get it right, but I think the odds are pretty shifted in the favor of the mediocre nowadays. 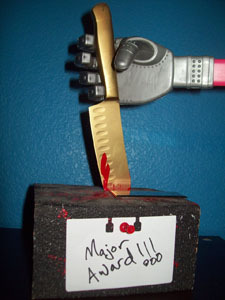 I am thinking of designing my own award for employees of Imaginology. An anti-award perhaps. Acknowledgement is important in people's lives though. It is a raw emotional cause and effect. Acknowledgement can perpetuate growth and opportunity. I think I actually enjoy acknowledgement of others work, more than I do my own. Maybe I should create an awards program? I would give out thinking man awards. An award of classical thought and appreciation for new accomplishments in media and design. These awards would be limited and do not necessarily have to be given on a regular basis. Perhaps it will become important. Perhaps I will make money on it. Maybe this is special.